This graphic novel is amazing. I picked it up before I read Revolver , Kindt's recent book from Vertigo, but only got around to reading it this week. As much as I enjoyed Revolver, this is a vastly better book. 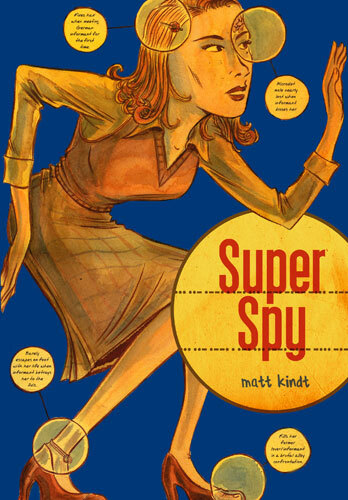 Super Spy is made up of many short chapters featuring spies during the Second World War. Each chapter is short - rarely more than ten pages, and many of them appear unconnected until the second half of the book, when they begin to intertwine and overlap in unexpected ways. Kindt uses these characters and their situations to explore themes of betrayal, love, and the necessity of duplicity in war time. Many of his characters act out of a desire to find safety for themselves or a loved one, while others have complicated and unknowable motivations. We return again and again to codes and ciphers, and children's books and comic strips are used to send messages across enemy lines. At times, it's hard to recognize some characters, as Kindt's art can make it hard to differentiate characters who aren't marked by a large facial scar or some other distinguishing feature, but that didn't much matter to me, as I got swept up in both the mechanics and the poetry of the spy lifestyle. Kindt works in a number of different styles and approaches over the course of this book, very effectively creating the correct mood or feeling for each different story. His writing is very lyrical and perceptive, and I loved some of the visual tricks he used, like when he arranged the wreckage around a person hiding from a sniper to resemble the snowflakes falling all around him. This is a very impressive piece of work, and I'm definitely going to track down more of Kindt's work, including his sequel to this book.